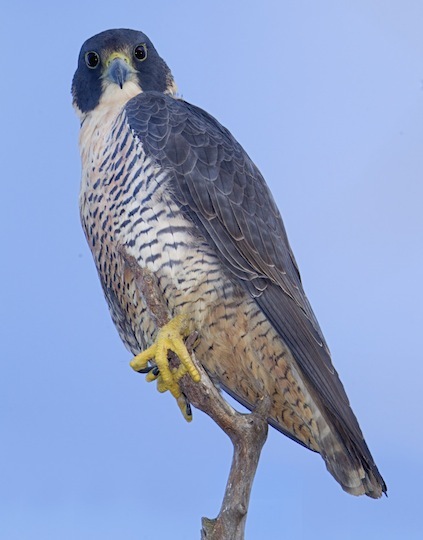 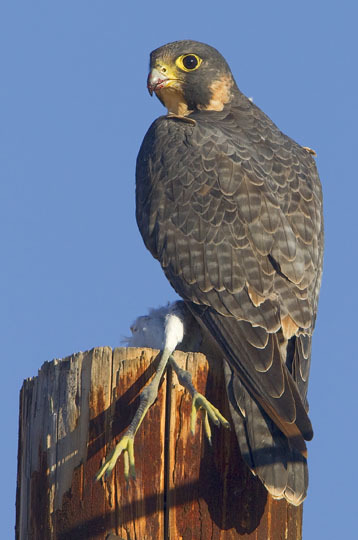 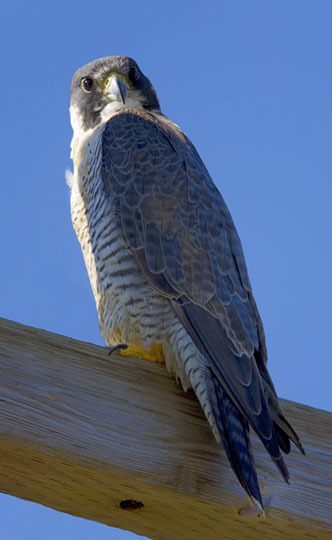 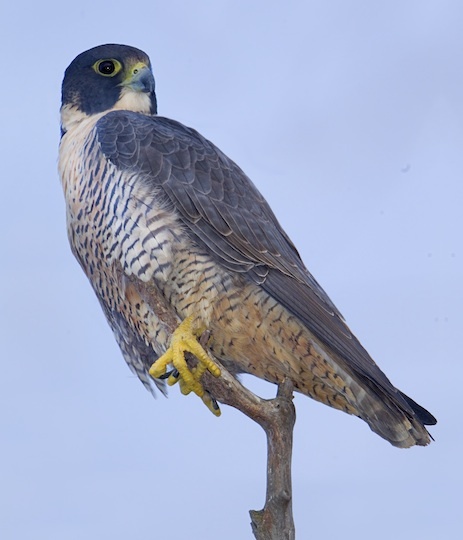 Peregrines are probably the fastest of all animals under their own power; in a dive they can exceed 150 mph. 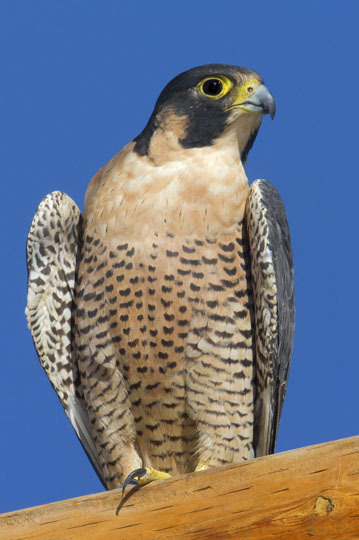 They have captured the imagination of people for thousands of years and are considered the ultimate falconer's bird. 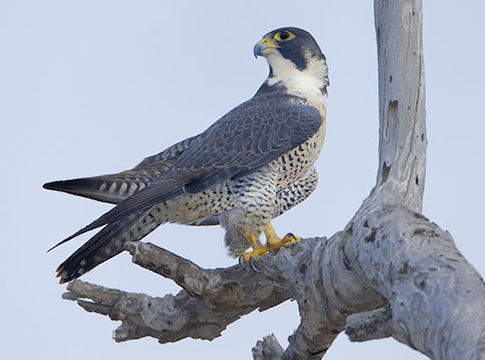 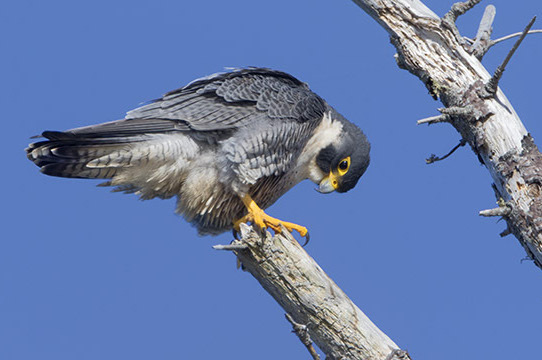 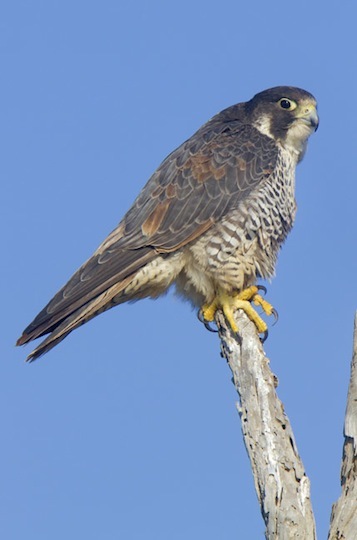 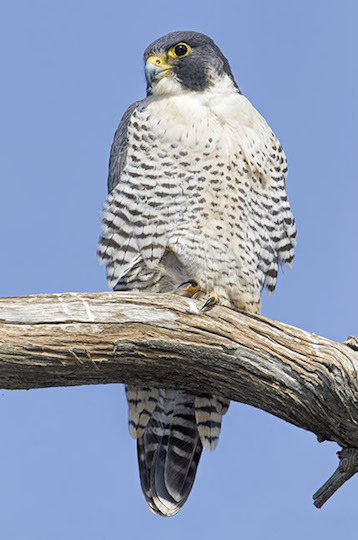 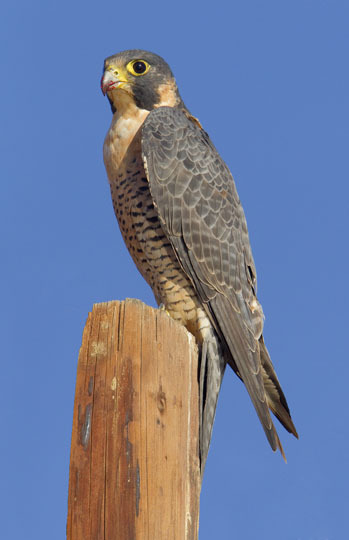 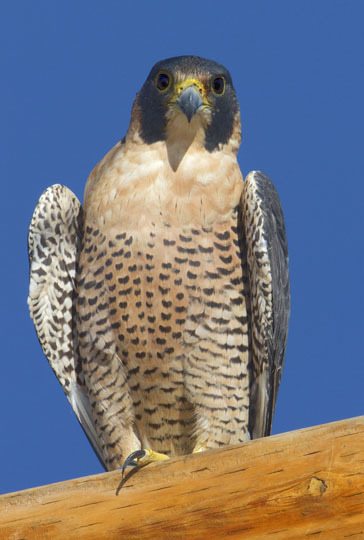 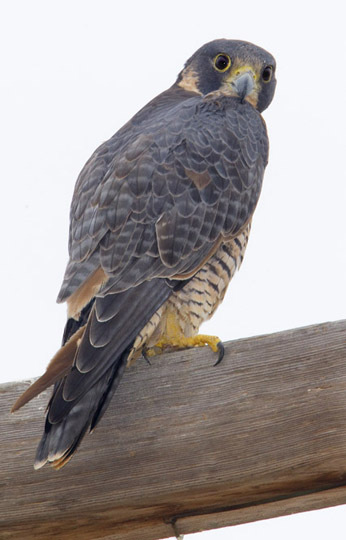 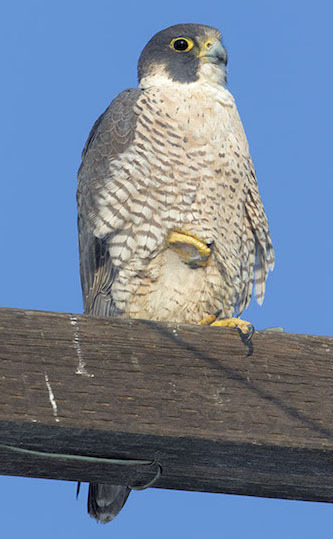 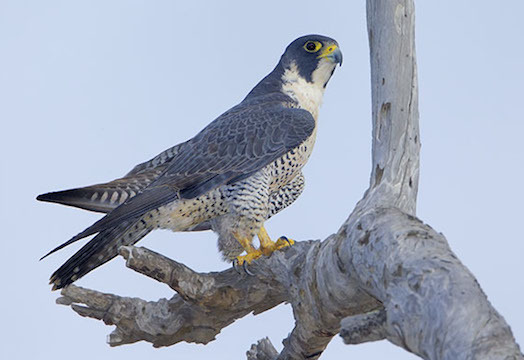 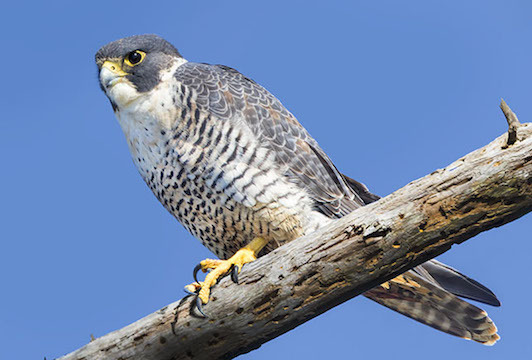 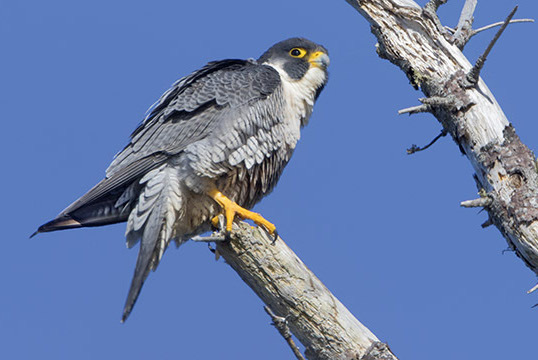 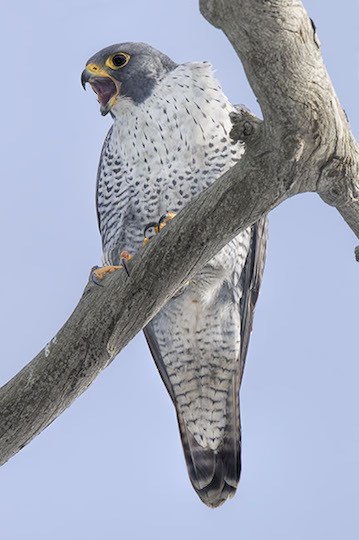 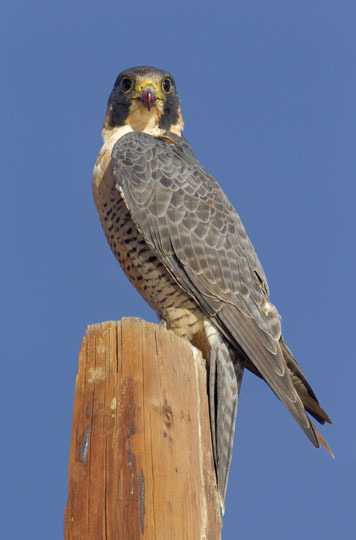 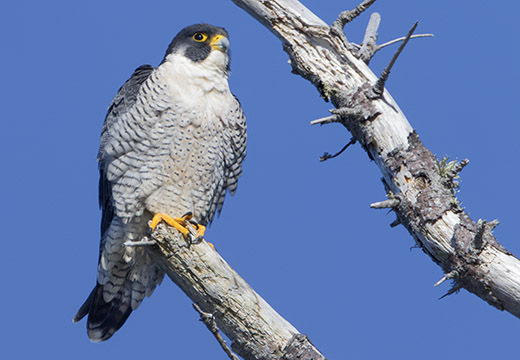 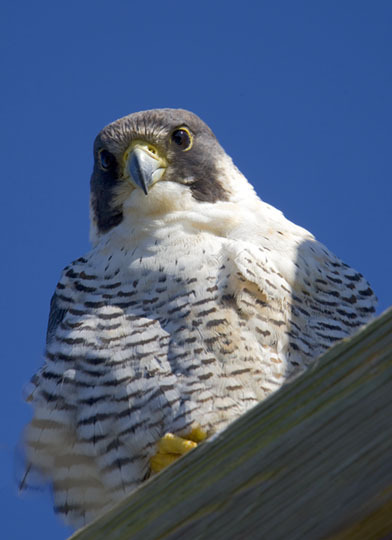 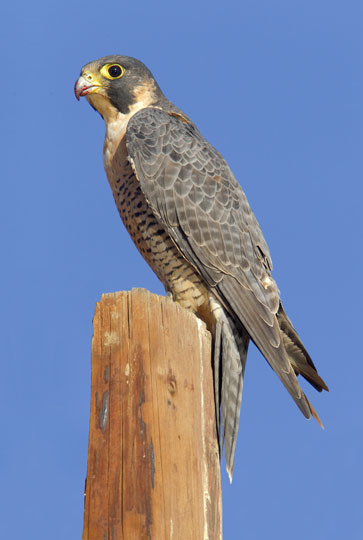 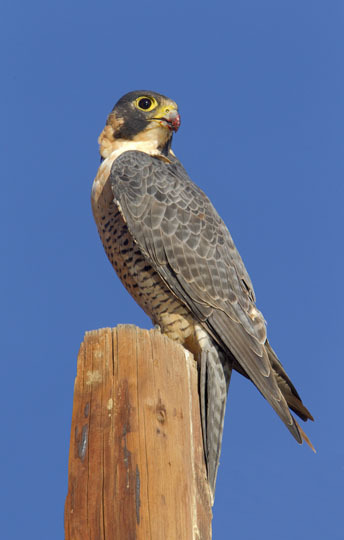 Like several other North American raptors they were hard-hit by pesticide contamination in the 1960s and 1970s, but are now recovering (notably, with the help of captive rearing projects managed by The Peregrine Fund). 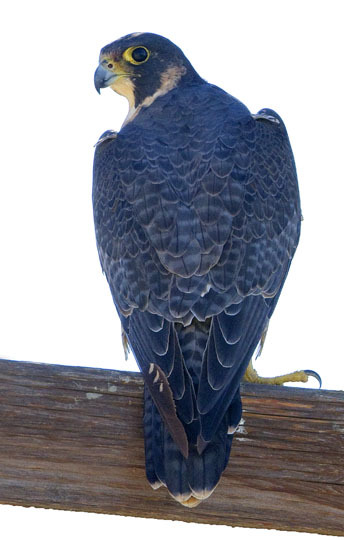 Adults (on this page) are dark slate-blue above and barred below. 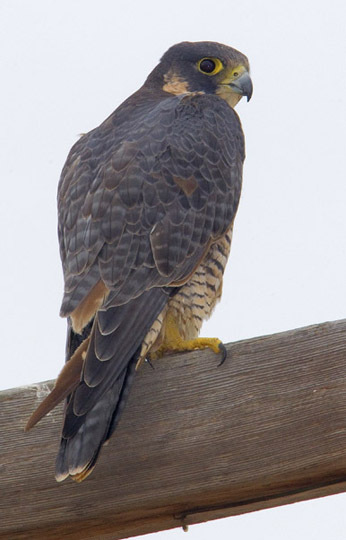 Juveniles are brownish above and streaked below; birds in their first winter show intermediate plumage. 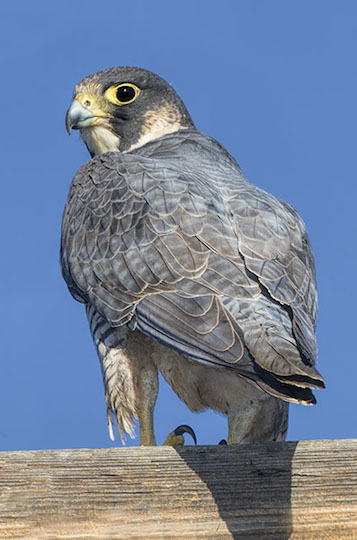 At all ages they have a characteristic stiff, powerful flight and a dark 'helmet' that permits identification at long distances. 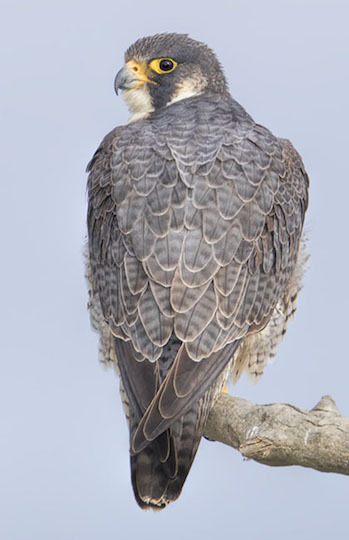 More photos of adults here, here, here, here, here, and here. 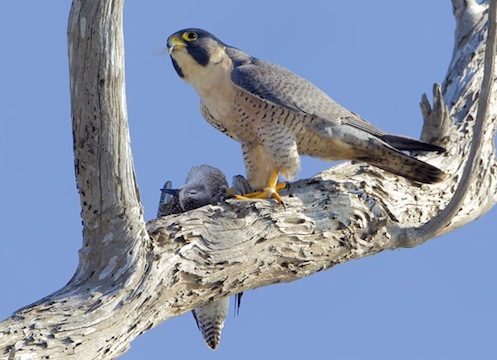 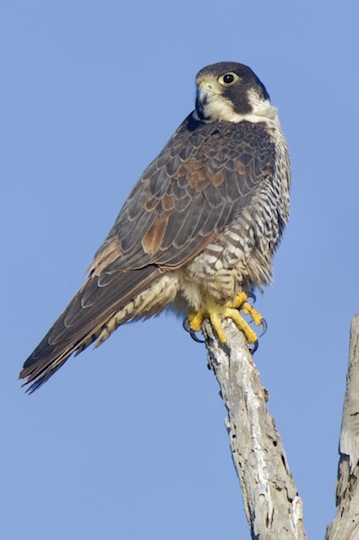 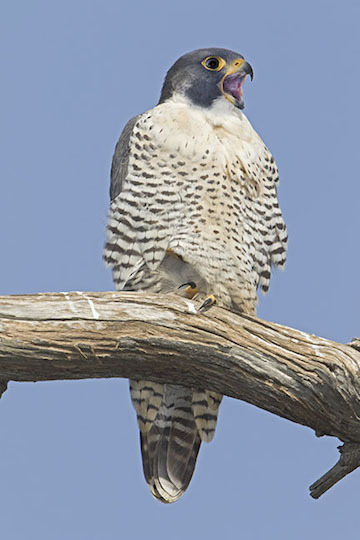 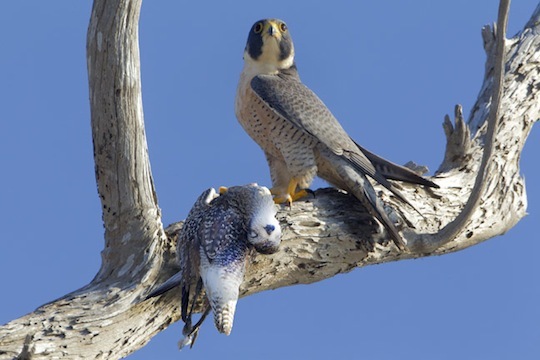 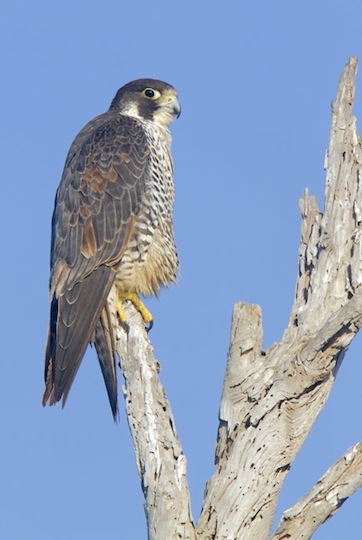 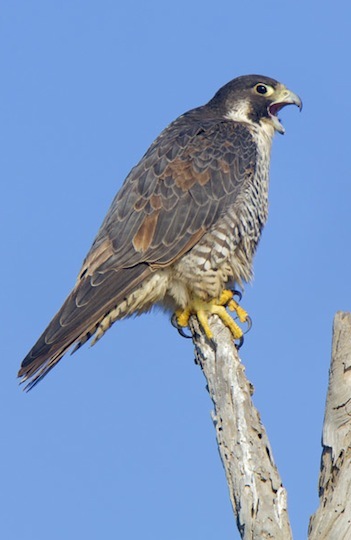 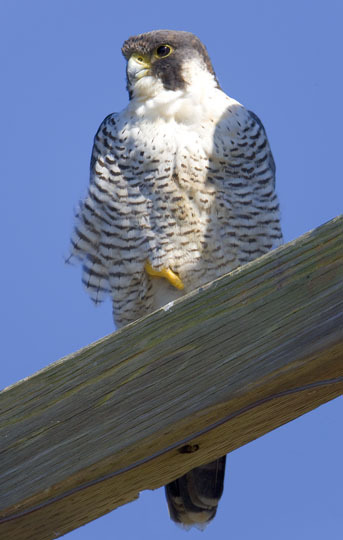 These falcons were at Colusa National Wildlife Refuge, the San Jacinto Wildlife Area near Riverside, Bolsa Chica wetlands in coastal Orange County, the Big Sur coast and Point Lobos (all in California), and in southern Florida. 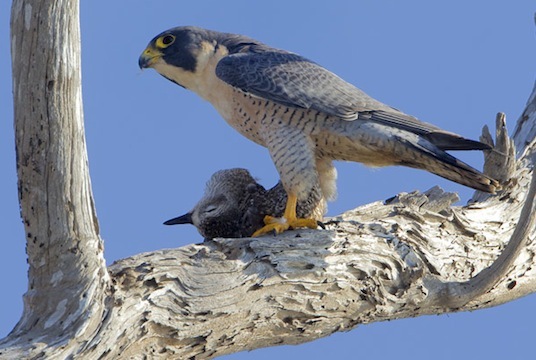 A male at Bolsa Chica had killed a black-bellied plover and was struggling to get a good grip while feeding (bottom rows) -- evidently the branch was slippery because he eventually dropped the prey. 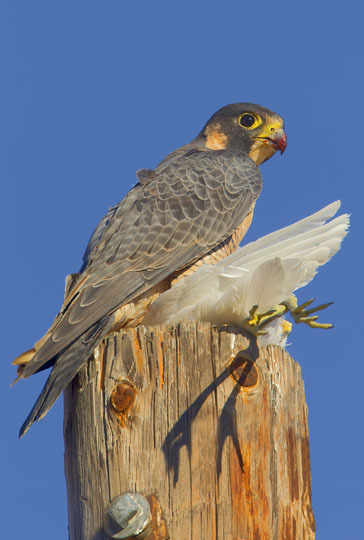 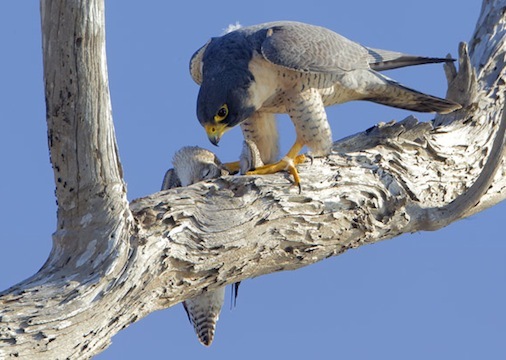 In some images, the powerful feet of these falcons -- used to strike flying prey at high speed -- are readily apparent. 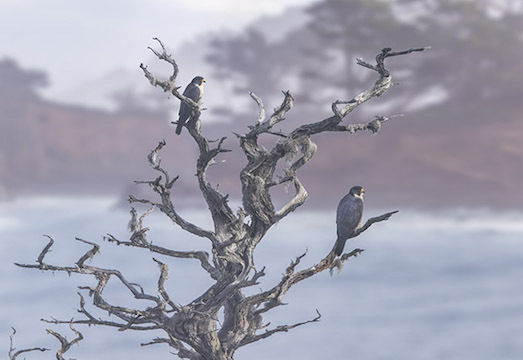 Confession: all of these were wild birds but a few were banded, and I digitally removed the bands.